Squash in pancakes? Sure! 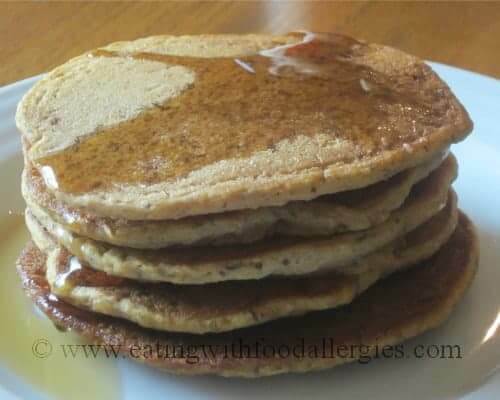 But I chose not to tell the kids that these are gluten free butternut squash pancakes for fear that they wouldn’t even try them. I was particularly nervous about serving these to my oldest son because he is a “Super Taster”. He can detect even the smallest amount of something he doesn’t like no matter how I try to disguise it. (This is probably a natural or learned defense mechanism for a kid with multiple food allergies). Can I get him to eat butternut squash roasted and mashed? Never. Did he gobble up not 1 but 4 of these pancakes? Yes! These got my Super Taster’s seal of approval. Hooray! I hope you enjoy them as much as we did! 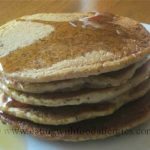 These pancakes are free of dairy, wheat/gluten, eggs, soy, peanuts, tree nuts, fish, and shellfish. In a small bowl, combine the flax seed meal and water; set aside for 5 minutes. In a medium bowl, whisk together the flour, baking powder, baking soda and salt. With a mixer, blend the flax seed meal and water mixture with the butternut squash until creamy. Add the milk, syrup, cinnamon, nutmeg and vanilla extract and mix well. Gradually add the flour mixture to the squash mixture until fully incorporated. Spray a griddle or skillet with cooking spray or 1 tablespoon of canola oil and preheat over medium low heat. Pour 1/4 cup of batter onto skillet (I spread the batter out with the measuring scoop to make the pancake a little thinner). Allow to cook until the edges of the pancake are firm and the middle bubbles (about 1-1/2 minutes). Using a spatula, flip the pancake and cook for another 1-2 minutes. Serve with pure maple syrup and eat immediately! *To roast squash, cut in half, scrape out seeds and place cut side down in a glass 9x13 pan. Cook on high setting for about 10 minutes or until the middle of the squash is mushy. Spoon out squash and place in an airtight container. Discard squash skin.